One of Hollywood’s biggest stars from days gone by suffers the bold kidnapping of his only daughter, and a veritable surfeit of suspects emerges. Heading up the fascinating cast of characters in this excellent whodunit from standout author Murray Lee Eiland, Jr. is a tough but sensitive private investigator by the name of Bart Northcote. Bart takes the case originally to help film legend Matt Martin locate his 18-year-old daughter Ariadne, the product of a long-ago affair. But instead it’s love at first sight for Bart and Ari, despite a significant age difference between the two. This is not the kind of writing style one normally associates with the P.I. genre, and it’s a welcome change. But back to the story. The stunningly beautiful Ari gets noticed quickly by one of her favorite stars, Dirk Dixon, who autographs her diary, then leans in to ask her out. She demurs, but, in a curious coincidence, Dirk’s at the scene of the abduction a few weeks later. Plenty of other suspects are available, however. There’s leathery, wizened Roy Carter, Martin’s right-hand man, who clearly resents the newly found teenaged heir to Matt’s millions. And, there’s Sheena, another member of the film star’s household coterie. She also dislikes the attention now being paid to Ari and her mother, Roxanna. But renewed love is in the air between Matt and Roxanna — much to the distaste of former squeeze Sheena. And it’s this very lyrical quality that makes the book stand head and shoulders above the usual lot in the crowded detective genre. The author takes great care with each character, moving subtly to craft a deeply textured tale of extraordinary charm and unpredictable turns. The anxious father declines help from the FBI in locating Ariadne, relying instead on Bart’s superior detection skills. These are put to the test, however, as first one, then another of the suspects is grilled with little result. Finally, with help from such unlikely, but colorful, sources as the colossally buxom Honey Moons, and a bungling bagman who tries to steal the ransom money, Bart picks up the scent, and the race is on to track the kidnappers to their lair. The denouement is violent, yet satisfying, as all good P.I. fiction should be. But does Bart eventually wind up with the alluring Ariadne? You’ll need to download this five-star thriller to find out. 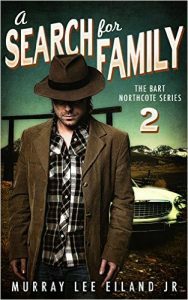 It’s only the second in what we hope will be a long line of Bart Northcote books from this stellar storyteller.